The Self-Organizing Map, or Kohonen Map, is one of the most widely used neural network algorithms, with thousands of applications covered in the literature. It was one of the strong underlying factors in the popularity of neural networks starting in the early 80's. Currently this method has been included in a large number of commercial and public domain software packages. In this book, top experts on the SOM method take a look at the state of the art and the future of this computing paradigm. The 30 chapters of this book cover the current status of SOM theory, such as connections of SOM to clustering, classification, probabilistic models, and energy functions. Many applications of the SOM are given, with data mining and exploratory data analysis the central topic, applied to large databases of financial data, medical data, free-form text documents, digital images, speech, and process measurements. Biological models related to the SOM are also discussed. 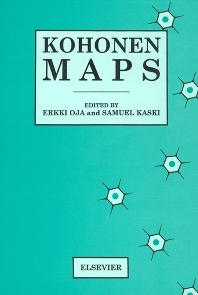 Preface: Kohonen Maps. Table of contents. Analyzing and representing multidimentional quantitative and qualitative data: Demographic study of the Rhône valley. The domeatic consumption of the Canadian families. (M. Cottrell, P. Gaubert, P. Letremy, P. Rousset). Value maps: Finding value in markets that are expensive (G.J. Deboeck). Data mining and knowledge discovery with emergent Self-Organizing Feature Maps for multivariate time series (A. Ultsch). From aggregation operators to soft Learing Vector Quantization and clustering algorithms (N.B. Karayiannis). Active learning in Self-Organizing Maps (M. Hasenjáger, H. Ritter, K. Obermayer). Point prototype generation and classifier design (J.C. Bezdek, L.I. Kuncheva). Self-Organizing Maps on non-Euclidean spaces (H. Ritter). Self-Organising Maps for pattern recognition (N.M. Allinson, H. Yin). Tree structured Self-Organizing Maps (P. Koikkalainen). Growing self-organizing networks - history, status quo, and perspectives (B. Fritzke). On the optimization of Self-Organizing Maps by genetic algorithms (D. Polani). Self organization of a massive text document collection (T. Kohonen, S. Kaski, K. Lagus, J. Salojárvi, J. Honkela, V. Paatero, A. Saarela). Document classification with Self-Organizing Maps (D. Merkl). Navigation in databases using Self-Organizing Maps (S.A. Shumsky). A SOM-based sensing approach to robotic manipulation tasks (E. Cervera, A.P. del Pobil). SOM-TSP: An approach to optimize surface component mounting on a printed circuit board (H. Tokutaka, K. Fujimura). Self-Organising Maps in computer aided design of electronic circuits (A. Hemani, A. Postula). Modeling self-organization in the visual cortex (R. Miikkulainen, J.A. Bednar, Y. Choe, J. Sirosh). A spatio-temporal memory based on SOMs with activity diffusion (N.R. Euliano, J.C. Principe). Advances in modeling cortical maps (P.G. Morasso, V. Sanguineti, F. Frisone). Topology preservation in Self-Organizing Maps (T. Villmann). Second-order learing in Self-Organizing Maps (R. Der, M. Herrmann). Energy functions for Self-Organizing Maps (T. Heskes). LVQ and single trial EEG classification (G. Pfurtscheller, M. Pregenzer). Self-Organizing Map in categorization of voice qualities (L. Leinonen). Chemometric analysis with Self Organising Feature Maps: A worked example of the analysis of cosmetics using Raman spectroscopy (R. Goodacre, N. Kaderbhai, A.C. McCovern, E.A. Goodacre). Self-Organizing Maps for content-based image database retrieval (E. Oja, J. Laaksonen, M. Koskela, S. Brandt). Indexing audio documents by using latent semantic analysis and SOM (M. Kurimo). Self-Organizing Map in analysis of large-scale industrial systems (O. Simula, J. Ahola, E. Alhoniemi, J. Himberg, J. Vesanto). Keyword index. Samuel Kaski received the DSc (PhD) degree in Computer Science from Helsinki University of Technology, Finland, in 1997. He is currently a Professor at Aalto University, the Director of Helsinki Institute for Information Technology HIIT, Aalto University and University of Helsinki, Finland, and the Director of Finnish Centre of Excellence in Computational Inference Research COIN. He is an action editor of the Journal of Machine Learning Research, and has chaired several conferences including AISTATS 2014. He has published over 200 peer-reviewed papers and supervised 18 PhD theses. His current research interests include statistical machine learning, computational biology and medicine, information visualization, and exploratory information retrieval. Director, Helsinki Institute for Information Technology, Aalto University and University of Helsinki, Finland.